"Every time we sang to people in Haiti it was like they were reborn," says Teresita Miranda, a member of a Cuban Creole choir which has just returned from a tour of the country. "Just looking at their faces as they listened to our songs was extremely moving," Ms Miranda told BBC World Service. The 10-piece choir, Desandann, spent two month-long tours in Haiti as part of Cuba's relief project following the January earthquake. Working with the Haitian cultural ministry, Desandann ran workshops in displaced persons camps, as well as performing for the public in specially arranged concerts. "When we arrived at the airport we saw everything destroyed, many people sleeping in tents," says choir leader Emilia Diaz Chavez. "The suffering of the population caused us a lot of distress. "But when we sang to the people we felt that we were helping in some small way. They would smile and applaud and I think that helped them." 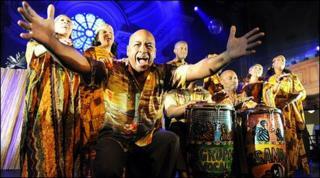 The tour had a special significance for Desandann, as the group's members are themselves of Haitian origin. "We are Cuban by birth but some of our ancestors, grandparents and parents, were born in Haiti," says Ms Diaz Chavez. "Cuba has long been a very popular destination for Haitians who go there to work in the sugar industry, cutting down sugar cane. "That's how our own families came to arrive in Cuba. And they taught us all the Haitian customs, they made sure we knew all about our Haitian heritage." Choir member Fidel Romero Miranda says their heritage meant there was special connection with the Haitians they met. "We were born in Cuba and now we've brought music to Haiti, music taught to us by our ancestors, and I think that's been very interesting and moving for the people in Haiti," he says. "They accepted it with much happiness and strong emotion." Desandann sing in Creole, a fusion of African, French and other languages, which is Cuba's second most spoken language after the official Spanish. It is also the most commonly spoken language in Haiti. Ms Diaz Chavez says the fact that the group sung in Creole meant they were able to make a connection with children in particular. "We went to an orphanage and the children had no idea what had happened to their parents because they were so small," she says. "To start with they didn't want to look us in the face. "There was one kid who began by being scared of us, not wanting to get close to us, but after we had sung to him in his own language, it seemed as if his mind had been freed up and he felt better."